I am so excited for Bloom, the first retreat for the women of South Dallas Community Church! There have been so many who have worked behind the scenes to make this weekend happen and I hope with all of my heart that you will be able to attend. I am confident this weekend will be filled with great things - things like rest, fun, laughter, great teaching, deeper friendships, and good food. Below, you will find the details of this weekend. Please use the registration form to RSVP ‘Yes’ to the Retreat! Retreat begins Friday, April 26 at 6:30 PM (Doors open at 5PM; arrive early to get first dibs on your bunk). Retreat ends Saturday, April 27 at 3:30 PM. You can find a tentative schedule HERE. To pay online, click HERE and select “Special Events” from the drop-down menu. To pay with check, please make your check payable to South Dallas Community Church and include “Women’s Retreat” in the memo line. To pay with cash, please place $50 in an envelope with your full name and “Women’s Retreat” marked clearly. *** If finances are the only thing keeping you from attending, please let Meg know as arrangements can be made. Not sure what to bring? Click HERE. As mentioned, three meals (dinner, breakfast, and lunch) will be provided. Additional snacks will be available, as well. We hope to accommodate all food allergies/intolerances. Please use the registration form to notify Meg of any specific food needs. Mt Lebanon Retreat and Conference Center is located just 20 minutes south of downtown Dallas. The address is 1701 Texas Plume Rd Cedar Hill, Texas 75104. Our group will be staying in the Hickory Lodge. 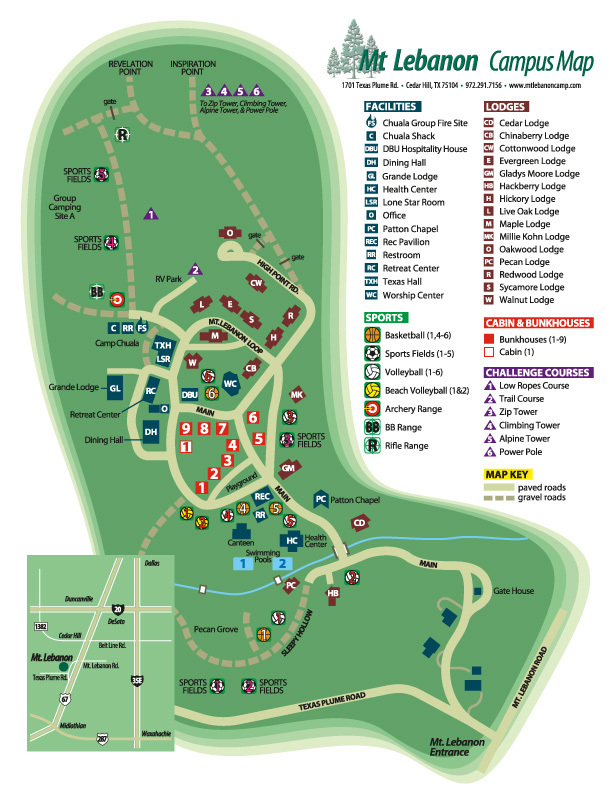 You can find a detailed camp map HERE. Parking is available on site. Carpooling is recommended, but definitely not required.